The wits appraisal and analysis has been around in orthodontics since 1952. The wits appraisal has become one of the most popular practices in evaluating the cephalometric evaluation of the anteroposterior relationship of the apical bases. Along with multiple other cephalometric analyses such as Rickett’s analysis the Wits analysis is still being used in practice today. What is the Wit’s Appraisal? The Wits appraisal was created to relate patient’s jaws anteroposteriorly to the cranial reference planes. This presents an inherent consistency of variations because of the craniofacial physiognomy. The appraisal was intended to eliminate such inherent variations and the problems associated with relying on the ANB angle (A point nasion B point). Wits decided to come up with an alternative method to assess the sagittal jaw relationship. This method is independent of apical base relationships to cranial landmarks. 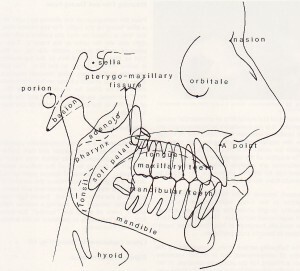 The appraisal entails projecting points A and B in two perpendicular lines, along the functional occlusal plane. Once these points have been projected they’re called AO and BO. Once you’ve measured the distance between points AO and BO the plane in between is what’s referred to as the Wit’s Appraisal. The original study was performed on caucasian adults, all of whom showcased excellent occlusions. This meaning in female subjects the distance between AO and BO was exactly zero, whereas in male instances the average BO was one millimeter anterior to the AO, giving them a wits reading of approximately -1 millimeter. This study was originally performed on Class I type malocclusions, in these cases we typically see points AO and BO coinciding in average. On the other hand, class II type in skeletal dysplasia point BO is typically posterior to point AO hence giving a positive wits appraisal. In the third scenario a class III skeletal disharmony, point AO is forward from point BO making a negative wits appraisal. Ever since the introduction of the wits analysis reading, numerous papers have been written attempting to describe different populations and classes using the wits analysis measurement. For instance Kim and Vietas’ study analyzed A-P dysplasia indicators. In this study they found that the mean measurement of the Wits appraisal within their control group of adolescent caucasian males and females was comparable to previous studies with normal occlusions. The study performed by the Foundation for Orthodontic Research by McNamara and Ellis comprised of 41 males and 81 females all with ideal facial aesthetics and normal untreated class I relationships. The recorded means found in this study were -0.72 for males and +0.93 for females. Similar studies in the South Wales population of England found nearly identical results using 25 head films of 15 year old females. In a study by Binder in 1979, he randomly varied the positions of the points, angles, and lines on the cephalometric drawing. Regardless of the arbitrary lines, they found the same ANB angles and geometric effects. He showed in this study that for every 5 millimeter anterior displacement horizontally the ANB angle was changed by 2.5 degrees. He also utilized an upward displacement of nasion altering the role of the ANB angle by 1 degree. All of the above findings reflect no correlations between two consecutive values when the wits appraisal is negative. When the ANB measurement is less than 4 degrees however, the wits analysis could be either positive or negative. When the ANB angle is somewhere between 4 and 8 degrees then all wits measurements will be positive. When both values are positive and the ANB measurements ranged from 1 degree to 8 degrees, the ability to predict the wits measurement is with 28% accuracy. All in all, what the wits analysis has given us is the linear measurement, an adjunctive diagnostic aid to assess the extent of anteroposterior skeletal dysplasia and determining the reliability of the ANB angle. Today we have tools such as CephX to our advantage, this makes it easier for dentists and orthodontists to perform cephalometric analyses and tracing with complete accuracy and track progress.